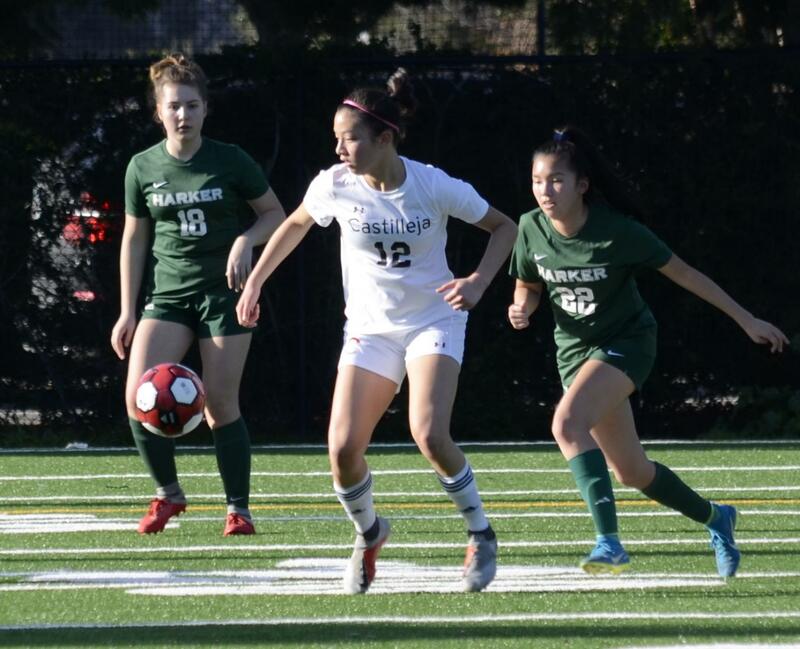 Aria Wong (10) and a Castilleja player fight for possession of the ball. 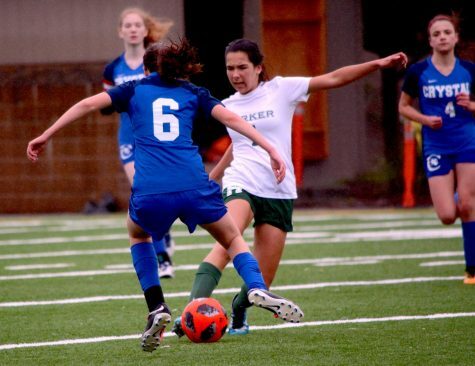 The girls next play against Pinewood on Friday at 4:30 p.m. at home. 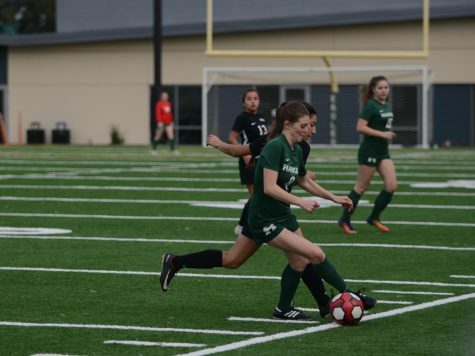 The varsity girls soccer team overpowered the Castilleja Gators 2-0 on Wednesday afternoon on Davis Field. 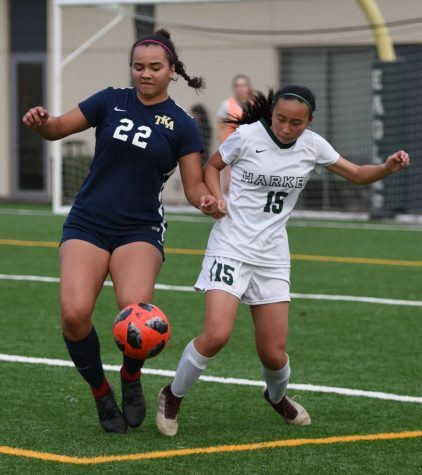 40 minutes of play marked by both teams playing a strong brand of defense left the score tied at 0 – 0 entering halftime. 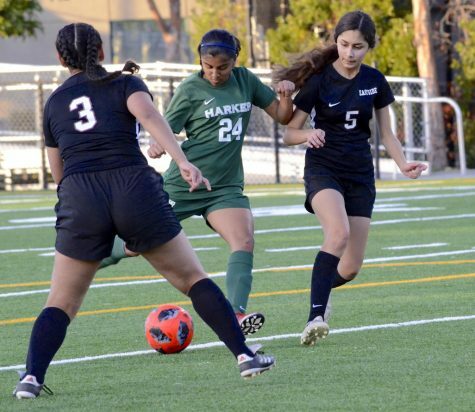 Coming out of halftime, with 36 minutes to left to play, Megha Salvi (9) scored the first goal of the game. 5 minutes later, Riya Gupta (12) punched in another score, putting the Eagles up 2 – 0. 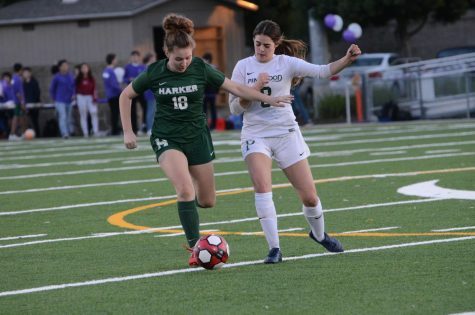 The lead would prove difficult for the Castilleja Gators to overcome, and after 30 more minutes of goal-less play, the buzzer sounded. The 2-0 win brought the Eagles’ overall record to 5-4-3, and their league record to 3-1-1. 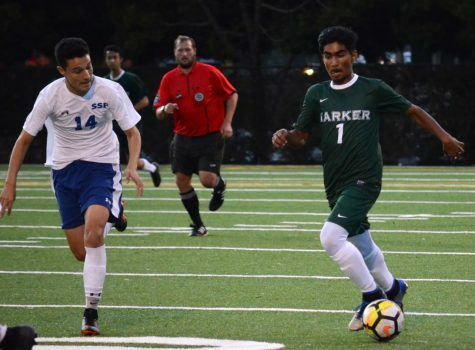 After the game, assistant varsity coach Kyle Valentine commented on the adjustments the team made at halftime that led to the two goals in rapid succession and ultimately, another “W” in the win column. 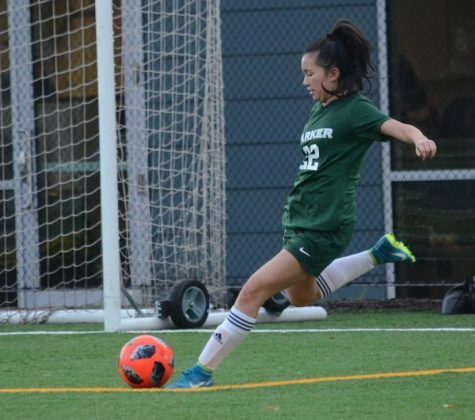 “We told the girls at half time just keep working hard. We told them to play with passion, play with heart. In the second half, we had to dig deep, roll up our sleeves and do the dirty work, block shots, and be competitive. 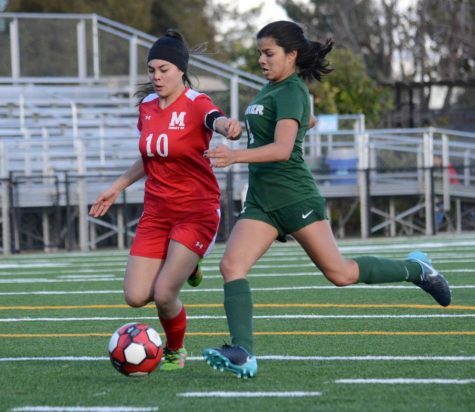 We focused on staying as a team, communicating, and the adjustments worked and the girls were able to come out on top,” Valentine said. 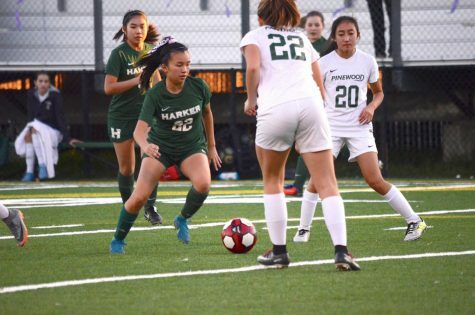 The girls next play against Pinewood on Friday at 4:30 p.m. at home. 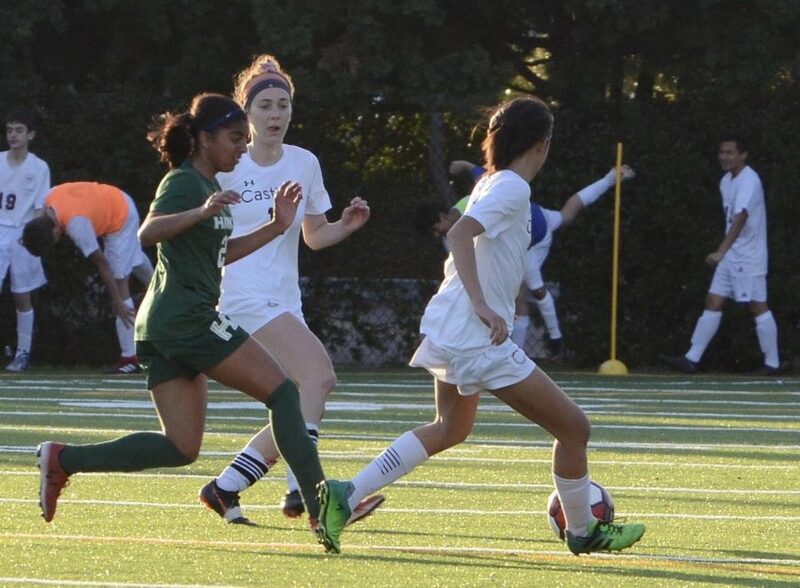 Megha Salve (9) sprints during the game. “We told the girls at half time just keep working hard. We told them to play with passion, play with heart. In the second half, we had to dig deep, roll up our sleeves and do the dirty work, block shots, and be competitive. 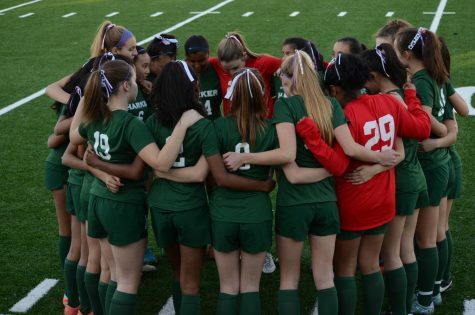 We focused on staying as a team, communicating, and the adjustments worked and the girls were able to come out on top,” assistant coach Kyle Valentine said.